Our Prophet (Peace be upon him) demonstrated ways for us to establish the Oneness of God, worship, excellent morals fulfilling the rights of mankind. However, the conduct of the majority of Muslims is in contrast to his example. On the 12th of Rabīʿ al-ʾAwwal, instead of spreading the message of mercy and his other virtues, the Muslim world is fraught with disorder and chaos. The state is so bad in Pakistan that the mobile service in some towns of Pakistan had to be shut down today and there is a strong police presence everywhere. Insulting Ahmadis and hurling profanities at them in the name of our beloved master is a daily practice but in celebration of this day, even this was intensified today. In their opinion, they are elevating the dignity and honour of this magnificent prophet. The siege and blockade led to the stopping of daily life with no access to schools, hospitals and shops in addition to losing millions in the economy, and all in the love of the Holy Prophet (Peace be upon him), who had told his followers to firstly avoid sitting on the streets and if necessary, to refrain from causing grief, spread peace, lower their gazes, promote good deeds and stop others committing bad deeds. But these self-acclaimed custodians of religion think they are entitled to call anyone a disbeliever or believer according to their own wishes. There is nothing in common with the teachings and the example of the Holy Prophet (Peace be upon him). These people may continue to do as they please, but we as Ahmadis are obliged to follow every aspect of the example of the Holy Prophet (Peace be upon him). Then, mentioning the love of the Holy Prophet for Allah the Exalted, the Promised Messiah (upon whom be peace) writes that when the verses about the idolaters being impure, unclean and the progeny of Satan were revealed, Abu Talib warned him of the dire consequences. The Holy Prophet (Peace be upon him) said that he didn’t care if he lost his life in his mission and offered to relieve him of his oath of protection. But Abu Talib was so impressed with his resolution that he assured him of his support as long as he was alive. The way the Promised Messiah narrated the above incidence, shows his own love for the Holy prophet (Peace be upon him). The Promised Messiah (upon whom be peace) further states, ‘I always look in amazement on the high status this Arabian prophet, Muhammad (Peace be upon him), may thousands of blessings and peace be upon him. It is impossible to gauge the limit of his high status and it is not possible for man to gauge his spiritual power. It is unfortunate that his status has not been recognised as was its due right. It is this very stalwart who brought back and restored the unity [of God], which had vanished from the earth. He loved God to the highest standard and his soul absolutely dissolved in [displaying] sympathy towards mankind. Therefore, God, who knew the secrets of his heart, granted him superiority over all prophets and over everyone, whether a predecessor or a follower. He granted him his desires in his very life. He is the fountain of all blessings. Whoever claims to have any excellence without benefiting from him is not human, but the progeny of Satan, as the key for every excellence has been given to the Holy Prophet (Peace be upon him) and he has been endowed with every treasure of the comprehension [of Allah the Exalted]. If one negates the opportunity of benefiting through him, one remains deprived forever. What are we and what is our significance? I would be considered ungrateful if I did not confess to have found true Unity and recognizing the living God through the light of this Prophet (Peace be upon him). We had the honour of receiving revelation and establishing dialogue with God and through this we were able to meet Him. All of this was accessible for us through this noble Prophet (Peace be upon him). The radiance that glistened from his guidance fell upon us like sunlight. We can remain illuminated as long as we stand to receive it. The essence of the Promised Messiah’s claim is that nearness to Allah can only be attained by following the Holy Prophet (Peace be upon him) in his example of worship in seclusion with fervor and devotion. According to one narration, a companion who witnessed the Holy Prophet (Peace be upon him) offering voluntary prayers in seclusion says that he could hear the sounds from the Holy Prophet’s (Peace be upon him) chest that were akin to noises produced from a Quern-stone. Once when Hazrat Ayesha (may Allah be pleased with her) asked him the reason for undertaking such discomfort even though his past and future sins had been forgiven, he responded by saying ‘Should I not become a grateful servant of Allah Almighty? the Promised Messiah (upon whom be peace) says that the holy Prophet (Peace be upon him) brought about a transformation in the Arabs’ lives from a state like that of animals to such high standard that they spent their nights in worshipping. It is our duty to live up to those standards. Huzur said that the reports from auxiliary organisations and the main organisation state that such and such percentage of people are regular in prayers, but unless it is 100%, we cannot get comfortable. It is the individual’s as well as the jamaat’s responsibility to improve the state. His truthfulness was so exemplary that one of his most bitter enemies testified to it, citing examples from all stages of life. Also, Abu Jahl was never able to deny that the Holy Prophet (Peace be upon him) was always truthful. Abu Sufyan also said in Heraclius’ court that the Holy Prophet (Peace be upon him) never lied. A Jewish scholar who saw him also said that his was not the face of a liar. Even today, truthfulness of his teachings and actions can bring non-Muslims closer to Islam, unlike lies, fabrications and deceptions. Ahmadis must always endeavour to raise their level of truthfulness by following Holy Prophet’s (Peace be upon him) example. If there is no truthfulness in one’s actions then people will also take religious teachings as false. The existence of God and religion of Islam are truths. It is our duty to spread this truth by means of truthfulness. The Promised Messiah (upon whom be peace) says that at the time of the Holy Prophet’s (Peace be upon him) advent, all previous religions had lost their spirituality. He brought the unity of God back into this world and brought about a transformation in the lives of the people that beasts were turned into men, then educated men and finally Godly men. Thus, in order to be true Muslims and do develop a connection with the True God , we need to raise the level of our truthfulness. It is only Ahmadis who can do this as they have pledged to give preference to their faith over the world. It should not remain a mere oath, instead all of our actions must bear testimony to it. The Promised Messiah (upon whom be peace) says that the Holy Prophet (Peace be upon him) was the greatest individual but was most humble in his demeanour that one example of his humility and meekness is present in the Holy Quran. The Holy Prophet once passed by a blind man while attending to some leaders of Mecca. Allah Taala revealed a chapter of the Holy Quran and the Holy Prophet went to the blind man’s house and lay down his cloak for him. The Promised Messiah (upon whom be peace) says that people understand God Almighty are always humble because they are always fearful of God. Just as He rewards the slightest of good deeds, He also disapproves of the most minor of sins. Hazrat Ayesha (may Allah be pleased with her) relates that a man asked to see the Holy Prophet (Peace be upon him). The Holy Prophet (Peace be upon him) told Hazrat Ayesha (may Allah be pleased with her) that he was a bad brother and a very bad son. When he came and sat down the Holy Prophet (Peace be upon him) extended great courtesy to him. When he left, Hazrat Ayesha (may Allah be pleased with her) asked him why he was so courteous despite him being a bad person. The Holy Prophet (Peace be upon him) said that he was always courteous to people and on the Day of Judgement the worst person will be the one who people avoid out of fear of his mischief. Once the Holy Prophet (Peace be upon him) was asked how to find out if one was a good person or a bad, he said that if your neighbour says you are a good person, then be sure that your conduct is good. Thus, it is incumbent on every Ahmadi to follow this example. Many calamities in the Muslim world of today are due to a decline in their moral standards and their forgetting the noble example of the Holy Prophet (Peace be upon him). The Promised Messiah (upon whom be peace) also says that The Holy Prophet (Peace be upon him) was an example for all virtues. We should see how he treated women. The Holy Prophet (Peace be upon him) was a civilised and courteous person. Even if an old woman asked him to remain at a certain place, he would stay at the place until she would grant him permission to move. Once he bought something and a companion of his offered to carry it for him but he refused saying that it should be carried by the person it belongs to. The Holy Prophet (Peace be upon him) spent 13 years of his Prophethood in adversity and 10 years in power and prosperity. His opponents included his own people, Jews, Christians, idol-worshippers, the Magians etc. They would drink to excess and saw forbidden things as lawful. Killing had no more significance to them than cutting mere vegetables. The situation in Mecca was so bad that they suffered hunger and humiliation and the Muslim companions would be beaten on a daily basis. They were then evicted from their home town. Then during the second period of the Holy Prophet (Peace be upon him) when he ruled the whole of Arabia. If he was selfish, he had the perfect opportunity to exact, But when he conquered Mecca he exclaimed that no blame shall lie on anyone. The high morals of the Holy Prophet (Peace be upon him) were really put to the test and he demonstrated patience, piety, sympathy, courage and generosity etc. So today’s celebration should be done by following the noble example of the Holy Prophet (Peace be upon him) with high levels of worship, complete conviction in tauheed and high morals. If we do not follow this example, there is no difference between us and others who are disintegrated by following their temporary leaders and so-called scholars. For us, the requirement of the pledge of allegiance to the Promised Messiah (upon whom be peace) is that all our deeds are done with the example of the Holy Prophet (Peace be upon him) in mind. May Allah enable us all to do this. 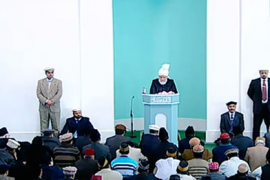 Huzur mentioned a few deceased and led their funeral prayers in absentia. First of those was sister Salma Ghani who lived in Philadelphia, USA, and passed away on 20th November at the age of 83. Amir Sahib USA Jama’at writes that she performed the Bai’at and joined the community in 1960 or 61 at the age of 24. She was a school teacher by profession. In 1975/76 she attended the Jalsa in Rabwah where she met Hazrat Khalifatul Masih III (rh). She served as Sadr Lajna for 15 years with great diligence and took the Lajna Imaillah to whole new level. She also served as the Sadr Lajna for Philadelphia Jamaat on numerous occasions. Aside from the five daily prayers, she was regular in Tahajjudprayers. She had a great desire for the construction of the mosque to be completed in Philadelphia and would pray for this profusely. This will soon be completed inshallah. According to the local president she showed complete obedience and co-operation to the local jamaat. She was diagnosed with cancer of the stomach 2 months ago. She told him of her will saying that according to the doctors she had four to six months to live, but she know she only had a few days left. She left instruction for her funeral prayers and coffin that had already been organised. She did not have any children or any other Muslims in her family but had very good relations with her siblings and other members of the family. The Sadr Lajna USA writes that her upbringing had taken place in a Christian environment, but she started questioning Chrisitan beliefs from an early age. She studied Catholicism, as well as other religions such as Buddhism, Hinduism and also other Christian sects. One of her friends gave her a pamphlet that Prophet Jesus (upon whom be peace) did not die on the cross. It contained answers to all her questions. She then went to the mosque and bought various books. She studied those books and eventually took the pledge of allegiance in Philadelphia where she lived until her death. She lived 54 years of her life as an Ahmadi, during which she displayed the highest standards of love, affection and loyalty for the Ahmadiyya Community and Khilafat-e-Ahmadiyya. During the time of Hazrat Khalifatul Masih IV (rh) she served as Sadr Lajna of USA for fifteen years, after which she also served as an honorary member of Lajna Imailllah. She also served as the head of the Lajna advisory committee for the African desk, as well as the American desk. She was always inclined to propagate the message of Islam. Due to her Christian background she would propagate the message to the Christians in a scholarly manner. Many people accepted Ahmadiyyat due to her efforts, and thus she became the source of guidance for many people. After several tours of Ghana and Nigeria, she became known as Auntie Salma Ghani. She will always be remembered in the USA for her piety and chastity as well as her popularity. May Allah the Almighty elevate the status of the deceased and grant steadfastness to those who accepted Ahmadiyyat due to her. May Allah enable the Jamaat of USA and the American people in general, to listen and accept the true message of Islam.